Nature documentaries are a dime a dozen, which is a good thing don’t get me wrong. But the footage can start to feel familiar after watching the many well-made wildlife documentaries we’ve come to see throughout the years. Netflix’s latest nature documentary offers jaw-dropping visuals. 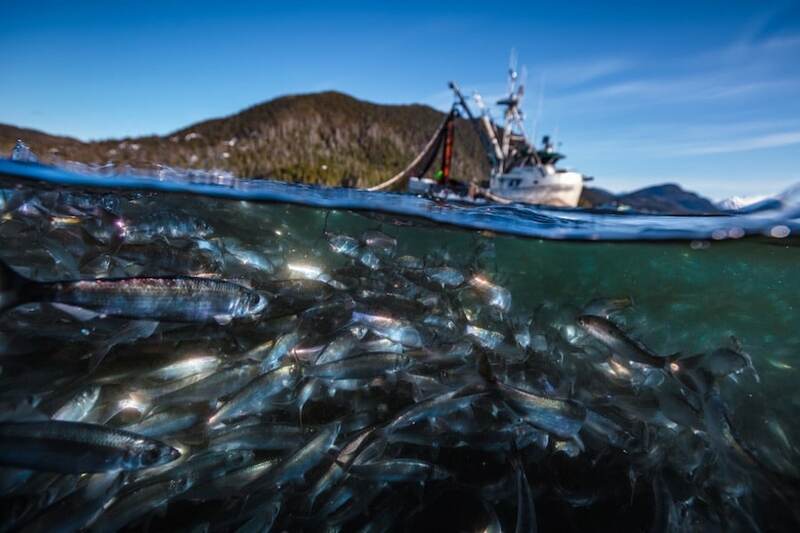 But with Our Planet—Netflix’s latest nature docuseries—not only is the message timely, but the documentary series is also incredibly well made. Through hour-long episodes, you’ll travel from the Brazilian rainforest to the glaciers of Greenland. It’s stunning visuals cause severe cases of “I must travel there now” while the Godfather of nature documentaries, David Attenborough, calmly explains why, in the next 15 years, we might not be able to. Because at the heart of Netflix’s Our Planet is a plea for change, a flare fired into the sky singling danger. It’s a nature series that makes you acutely aware of humanity’s impact on the environment and the severe consequences if we don’t make changes right now. But thankfully the Netflix nature docuseries does provide answers, and in the breakdown below you’ll find not only what we liked about Our Planet, but also some of the insight it provides. 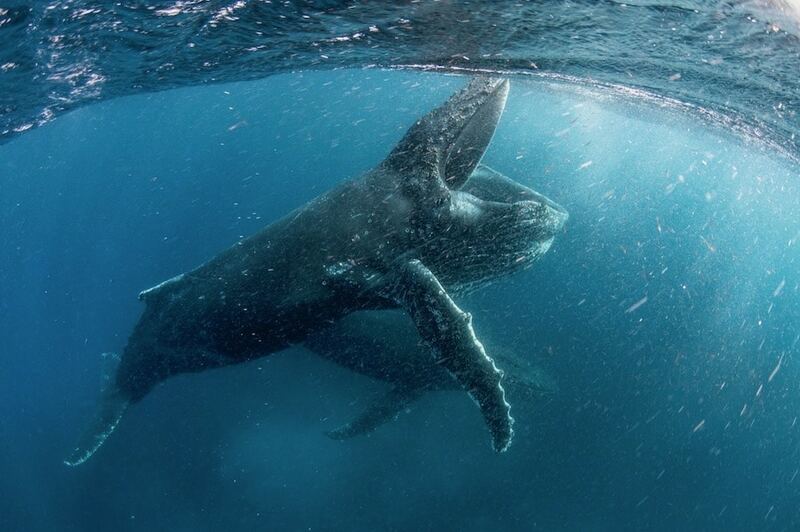 Swim underwater with Humpback whales in Netflix’s Our Planet nature docuseries. Each of Our Planet’s eight episodes are focused on a different biome and by extension, a different problem. Whether it’s the decimation of the Amazon jungle due to deforestation or the death of the Great Barrier Reef, it’s all here and very real. The structure of each episode is unique, showing us a micro and macro view of that biome, including the many creatures that live there. The filmmakers connect us emotionally to the routines and lives of the many animals living in a natural-wonder, before pulling back and explaining how dire the situation has actually become. This type of rug-pulling could become tiresome after eight episodes, but each episode does such great job of integrating the human perspective with an animal one, I almost always forgot the other shoe was going to drop. And maybe that’s the point – showing us how easy it is to forget, how easy it is to eschew the important ecological factors of a given nature-filled hotspot because the mating ritual of a rare bird species is so cute. 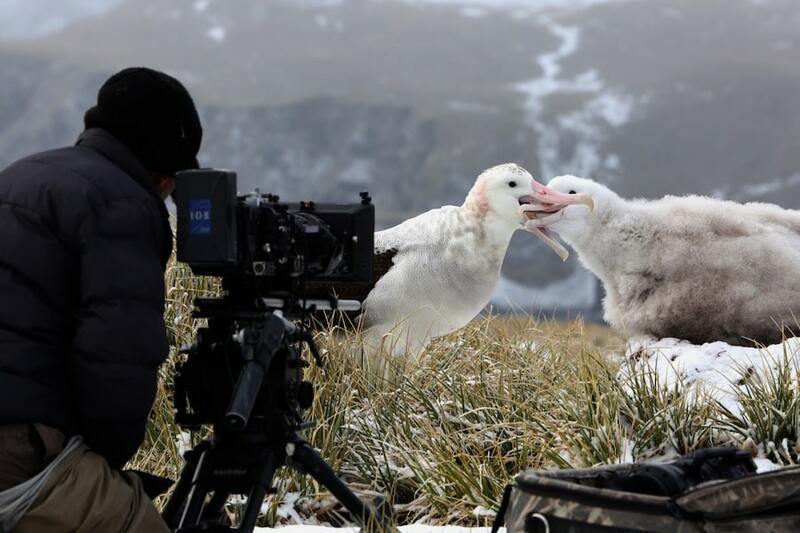 Each of the nature documentaries 8 episodes are paired with behind-the-scenes footage. All eight episodes of Our Planet on Netflix are gorgeously shot, which is to be expected from a groundbreaking nature documentary series. What’s fascinating though, is that each episode comes paired with a behind the scenes featurette that showcases just how much work went into capturing the beauty and volatility of Our Planet. In the first episode, for example, we get to watch the process of capturing a giant chunk of a Greenland glacier breaking off, the helicopter pilot deftly moving above, around and through these gigantic sheets of erupting ice. At one point you even see a gigantic submerged slab breaking the surface, creating massive waves that the whirring film crew sat just on top of. Shot by a crew of camera operators, including Doug Anderson and Sophie Darlington, this nature documentary moves from the serene to scary quickly, tearing down the idyllic setup a few moments after we’ve been introduced to some of Earth’s coolest creatures. “The only way you make a series like this is by having a huge team of people who work together. In wildlife filmmaking, that starts with the people who research and find the stories, then goes into the people who can get you into the field and find the animals, and then the incredible cinematographers,” Scholey said. It’s also a series, like so many others, that frequently had me wondering “how the hell did they capture this footage?” Episode eight is a great example. I won’t spoil it here, but one of the world’s most elusive creatures stands in plain view for us to marvel at. The filmmaking talent is on full display with Our Planet and the behind-the-scenes featurettes are a great addition. 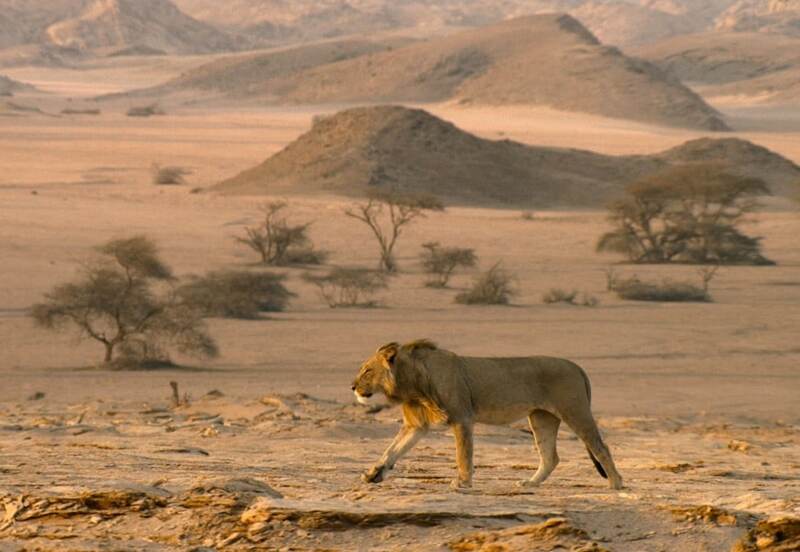 A male lion wanders through a desert in Namibia. The soundtrack is another surprising element of Our Planet. Music is often operatic and pulse-pounding in nature documentaries of this sort, but the soundtrack here is composed by Oscar winner Steven Price. The score vacillates between dangerous and ethereal, shifting on a dime with the whims and scenarios of the creatures on film. It never feels out of place or overbearing, it instead tells you how to feel without hitting you over the head with its themes. 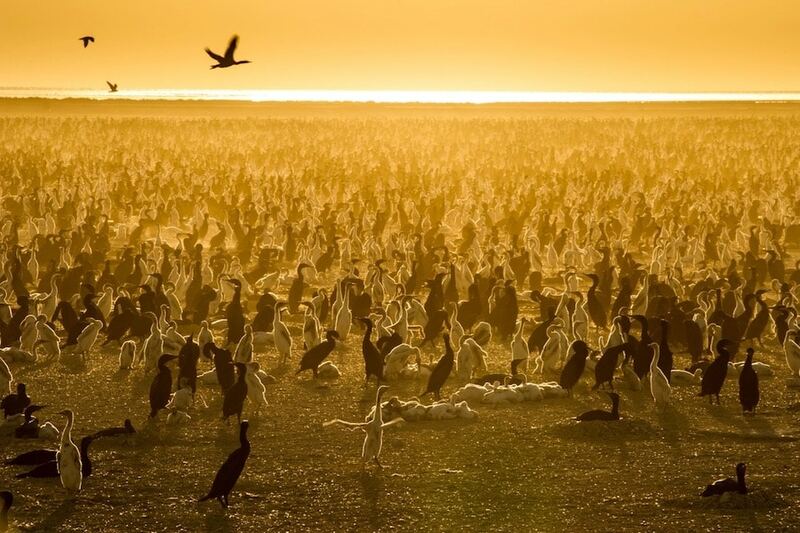 Netflix’s latest wildlife documentary features a colony of endangered Socotra Cormorants. It would not be a nature documentary without the godfather of voiceovers, David Attenborough, and thankfully the 92-year-old is back and in fine form. His steady voice carries us through the highs and lows of Our Planet and assures us that everything is going to be okay as long as we do our part. “I’ve worked with Sir David Attenborough from the age of 24, and I’m 60 now. What’s extraordinary about David is that each time you meet him and work with him, another level of greatness comes out of the man. He is such a powerful voice; if you listen to the detail of his narrations, they are works of art. He elevates our films. He’s an incredible part of this project, and we’d be lost without him,” said Scholey said. The message at the heart of Our Planet is what intrigued, frightened and empowered me during its eight hour-long episodes. As cliche as it is to say, it’s a must-see series that has the potential to effect change as trite as that is to say. Netflix’s latest nature documentary will also feature an Our Planet website, an excellent educational companion for students, teachers and the climate change curious. When Our Planet launches on Netflix April 5th, the companion website for the environmental docuseries will offer a ton of extra information and behind the scenes info for people to read and watch. “The most challenging part, I think, is trying to get the balance between showing people the beauty of the natural world, but also the peril the natural world is in — and to make that a coherent story. I know most people probably think that in doing a big wildlife series like this, the biggest challenge is finding the animals and all of that, but the hardest thing is conveying that narrative,” said Scholey.